Ever since making this chicken last week, I’ve been craving something with spinach and artichokes. After much research, I started to make one of the only recipes I could find that didn’t have dairy (this recipe), only to realize halfway through that we were out of garlic powder (and quinoa). To accomodate for the flavor, I altered the recipe and sauteed the spinach and artichoke with fresh garlic first, rather than adding it in at the end. 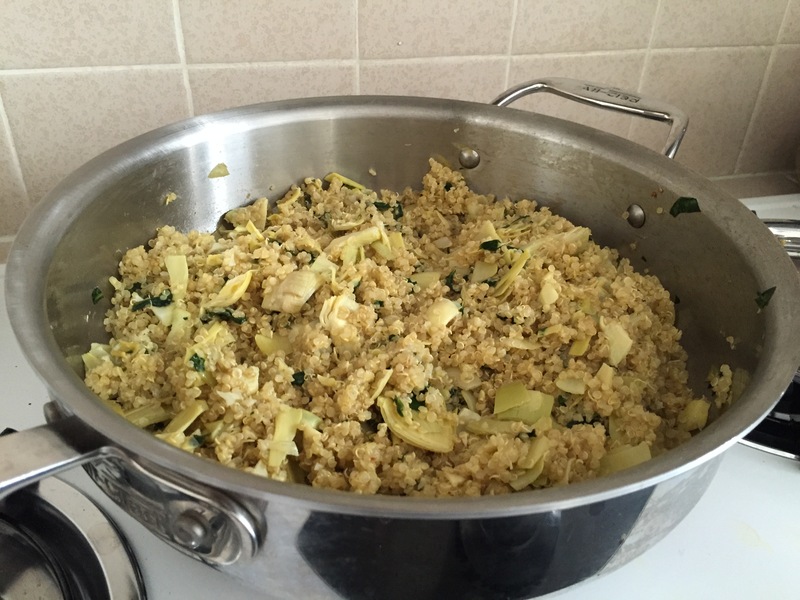 I also used half the amount of quinoa, since that’s what we had on hand – and used less olive oil. What resulted was the perfect light lunch, that was a hit for the whole family. This is such an easy dish to make, and we’ll definitely be making it again. In a saucepan, combine water, broth and uncooked quinoa. Bring to a boil over medium heat. Once boiling, cover and reduce heat for 13-15 minutes, until liquid is absorbed. When finished, reduce heat and keep covered for 5 minutes. In a medium saute pan, heat on medium. Add olive oil. When heated, add garlic and cook for about a minute until fragrant. Add spinach and artichokes, sauteeing until spinach is wilted. When it starts to wilt add the pinch of salt. Once vegetables are softened to your liking, add quinoa to the saute pan.